There's a secret organization somewhere in England created to defend the Queen and country from monsters of all sorts. Yes, it's hard to believe in this day and age....but really, isn't this the true age of monsters? Enter Hellsing, an agency, long in tooth, with the experience, know-how, and...er...equipment to handle the problems that arise when vampires, ghouls take on these dark forces. "What equipment?" you may say. 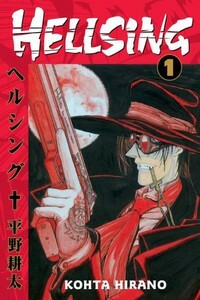 How about another vampire, and a big pistol loaded with special silver bullets? That oughta do the trick. Hellsing the long-awaited manga is finally in America, thanks to Dark Horse Comics and the folks at Digital Manga, and you're gonna love it.